When veteran health and environmental reporters dig into the GMO debate, they start showing people what all the most trustworthy scientific and medical institutions have found: This technology is no riskier than other cherished new technologies we constantly introduce into our lives. I didn’t see the piece until this weekend, when someone on my Twitter feed mentioned it. Everything about it, starting with the “Frankenfood” graphics, is editorially slanted. The piece leads off with the news hook–a GMO labeling bill being reintroduced in Congress by Democrats. Then it displays the results of a recent AP poll that found a large majority of Americans were in favor of GMO labeling. when people tell pollsters they favor GMO labeling, they don’t really know what they’re saying. Because overall public knowledge about GMOs is very low, many GMO polls give “a measure of what people will say they want to label when they have no idea what that means,” explains Yale public opinion researcher Dan Kahan. The MSNBC piece turned to two GMO labeling proponents–a popular chef and an Oregon Democratic congressman–to explain why GMO foods should be labeled. The MSNBC host of this segment came off as a vapid facilitator; he served up softball questions to his guests that reinforced the “frankenfood” theme. He also implicitly framed the GMO labeling push as a Democratic issue. Americans, it should be noted, are not polarized on the GMO issue. And despite the best efforts of activists to inflame the GMO discourse with skull and crossbones rhetoric. The frankenjournalism recently shown at MSNBC was essentially an infomercial for anti-GMO campaigners. As such, it was a disservice to its viewers and the public discourse on GMOs. One-sided, purile, agenda driven agitprop delivered by vapid facilitators. So this is different from any other story on MSNBC how exactly? Or on the other side of the spectrum, Fox News? Each side has its own echo chamber, and it’s best to avoid both if you want to have any chance of rational thought on a topic. Personally, I try to get the facts myself and then make up my mind, regardless of what partisans on either side adopt as their group think. Fox has its ideologues, who by the way end up with the lowest ratings for the network. But it also has a large percentage of straight news reporting besides the opinion. Even on the opinion side (O’Reilly, Special Report) it has a balance and ideological diversity never seen on MSNBC. In other words, it’s worth watching if you want to be fully informed. The problem with MSNBC is that it’s business model is to feature hosts who’s main qualification is being a stereotypical diversity line up straight out of central casting all saying exactly the same thing in a slightly different way. And as far as the info takeaway from MSNBC, how is it at all different from what you could get watching the daily White House press briefing? Zero daylight between the two, MSNBC brings no added value to the viewer unless you’re just looking for an echo chamber, a problem reflected in its ratings. Keith, if you want some heavily slanted “journalism,” check out the NPR show “The Takeaway” some time. It’s such total left wing trash I can’t even listen to it. It’s bizarre to me. There a lot of “vapid facilitator” types on this, who are otherwise down with Mercola being a dreadful source, and who align with the scientific consensus on climate. But on this issue they turn their backs. And I understand the issue isn’t polarized. That’s not the problem with Dems. The problem is they want to cling to the scientific consensus on climate (87% in the recent Pew/AAAS poll), while abandoning that on GMOs (88% in the same poll). It’s hard to be allies with folks who do cafeteria-style picking of the evidence and consensus they want to use. I don’t think very many people track the “consensus” on any issue. Most follow their tribe bcz doing otherwise would alienate them socially. If the consensus and the tribe are the same, so much the better. If the tribe refutes the consensus, the persecuted-minority – and of course the infamous “truth-to-power” meme – makes the tribal position all the stronger. And doesn’t The Tribe ultimately form it’s own consensus? All of which brings us back to the reality that consensus is meaningless. It does not determine or imply truth. Absolute truth can only be determined by experimental demonstration and verification. Which is why so many people can accept that GMOs are safe and refute the “consensus” on climate. And it’s funny, you know, because if a person accepts the “consensus” on climate (climate change is a threat to human existence) and rejects it on GMO, they’re accepting an unverified postulation with little empirical evidence to support it and rejecting a well-established experimental result. Comical. Plenty of people track consensus. Isn’t that why it was so funny when John Oliver did that bit with the room full of scientists on climate? And that’s the precisely the thing: the Dems cling to that, while in the same room of scientists they are the ones on the outside on GMOs. Never heard of the John Oliver bit. Was it TV? I don’t do much TV. Go talk to a guy on an oil rig or truck driver or a Starbux barista or an REI clerk. They may know what the consensus is, but they don’t follow consensus per se. They follow what their crowd of friends follows. Sure, legislators and NOAA and FDA administrators are aware of what constitutes consensus on scientific issues and to a greater or lesser extent follow that consensus. Those people constitute about 0.3% of the voting public. Most voters don’t follow consensus. They make up their own minds. That’s why we have no action (thank goodness) on climate change. *That’s* what proves that people follow or seek to know scientific consensus on an issue? People who “know” that there’s a “97% consensus” on climate change don’t *know* anything about climate science. All they “know” is what’s been parroted in their tribe’s favorite media outlet. John Oliver has a show called Last Week Tonight on Sunday late night on HBO. Opinions on GMOs are not significantly associated with political orientation. Didn’t you just say that? Ok, one more time: it’s not the polarization. It’s the hypocrisy. What about the scientific consensus that using land, water, fertilizer, herbicide, etc to grow corn for ethanol feedstock has greater adverse economic and environmental impact than using gasoline? When roughly 40% of corn grow in the US is used to produce ethanol, and majority of that corn is Roundup Ready corn, then it is no surprise that GMO seed and pesticide manufacturers strongly support and lobby for continued corn ethanol subsidies at the expense of taxpayers and the environment. Yes, GMO corn is are safe to eat, but don’t kid yourself, it’s current use in biofuel production is anything but economically or environmentally friendly. I admit I was really surprised when all the enviros a few years back wanted bio-based fuels. I didn’t support that. Seemed like a bad idea to me to convert land to your gas tank. But I don’t drive much. I’m sure most Prius drivers use more fuel than me. I have lobbied for a label on gas pumps that says “Contains GMO”. This has 2 benefits: keeping GMO haters at home, and reducing greenhouse gasses. Nobody’s picking that up though. Go figure. If one doesn’t support the GMO and pesticide seed manufacturers support/lobbying/push for bio-fuel subsides then what would be the best way for one to voice their disapproval? Any an idiot would think the Pew/AAAS poll wasn’t concocted to show the results it got? Sheeeesh. Why is it impossible to believe the results? I took it. I saw the questions. Do you have any evidence for this claim? While you are absolutely correct about the horrid journalism exhibited by MSNBC, you continue to narrowly frame your argument concerning the lack of evidence that GMOs are harmful to humans. The frame should not be limited to just humans! One of the primary modifications introduced by Monsanto and their ilk, is to increase the resistance of GMO crops to herbicides so that higher levels of these chemicals can be used for weed control without damaging crops. Peer reviewed scientific publications are more and more pointing a finger at these chemicals as a potential cause of the bee population collapse occurring world-wide. On top of that, in an incomprehensible move, the FDA approved the application of enormous quantities of roundup to US wheat crops 5 days or so prior to harvest. This kills the wheat, softening the stems and forcing the dying plants to mature their seeds more rapidly so that higher yields are realized and equipment wear and tear is reduced. There is now mounting evidence, published by a reputable scientist, that the so-called gluten Intollerance, a primarily US phenomenon, is being caused by the residual chemicals left on the grain from this massive pre-harvest application. Finally, with regard to GMO labeling, if these products are so harmless as the industry suggest, why do they want to hide it from consumers? We get to choose whether or not our food is high sodium or high sugar or high fat now, why do you support the industry trying to keep us from choosing GMOs or not? It’s very easy to choose non-GMO. Organic and the non-GMO label are already in place. But your comment perfectly illustrates the flaws in the labeling. If you have issues with wheat being sprayed with glyphosate–that is completely unaffected by a GMO label. Wheat is not GMO. And if you are under the impression that if GMOs went away tomorrow farmers would stop using herbicides, you are wrong on that too. And this is pretty much what the problem with labels is: people think it will solve all the things they claim to hate–and it doesn’t touch any of them, in fact. Mis-aiming actually ends up hurting the issues you claim to care about. Because you aren’t actually solving the problem. You are just pretending you are. No, labeling laws are NOT in place. They are a State by State patchwork with no consistent enforcement. That is what this issue is all about. Do you want an informative national standard where we the consumers have a right to know what is in our food or not? You have an informative national standard to avoid GMOs. It is called “organic”. You also have one perfectly suited to your philosophical issues with GMOs: Non-GMO Project, it’s just like Kosher. There is no law that would govern your wheat concerns at all, and none of the proposed label laws would do so either. Wow so much wrongness in this post. so that higher levels of these chemicals can be used for weed control without damaging crops. Nope, the application rate is still the same, only the timing changes with GMOs. Peer reviewed scientific publications are more and more pointing a finger at these chemicals as a potential cause of the bee population collapse occurring world-wide. The are exactly 0 peer reviewed studies that claim this. Colony collapse disorder has nothing to do with GMOs. FDA approved the application of enormous quantities of roundup to US wheat crops 5 days or so prior to harvest. Well it is 10 days, and the application rate once again is the same, 16 oz per acre. It is not used to kill the wheat, because the wheat is already dead. it evens out the drying and kills the perennial weeds so you dont have to spray again in the spring. No Glyphosate is absorbed by the plant because it has stopped growing. This method is rarely used in the US, where the wheat can dry naturally and there is a longer drier growing season. It is used mostly in Europe where they have moist Autumn weather, and Canada where the growing season is short. Plus this has nothing to do with GMOs, wheat is non GMO. I believe the biggest problem with GMO corn and soy is that they are primarily being grown for use as animal feed and biofuel. For instance, roughly 40% of GMO corn grown in the USA is being used as ethanol feedstock. The pesticide manufacturers are strongly pushing for continued use of GMO corn and soy to produce biofuels, even though there are far more environtmentally friendly ways of producing biofuels that do not require wasting as much land, water, pesticides, etc. So, while many on the label-GMO side are arguing the wrong reasons, I believe they are on the right side of the issue. even though there are far more environtmentally friendly ways of producing biofuels that do not require wasting as much land, water, pesticides, etc. Name one that is cost effective? And corn for ethanol really has nothing to do with GMO crops, they could switch to non GMOs and do the exact same thing. I am a fan of using cellulosic wastes from agriculture waste, food waste, and lumber waste as feedstock for biofuels instead of growing crops specifically for the purpose. GMO crops have EVERYTHING to do with corn ethanol, as the seed and pesticide manufacturers are lobbying congress and using the power/money/influence to continue its practice. In my opinion some of the strongest forces against this corruption are currently the organic and label-GMO movements, while I do acknowledge both of these alternative have their own significant issues that I disagree with, but I can tolerate more than current corruption that is taking place regarding corn and soy biofuels. Sorry I would be a big supporter, but cellulosic doesn’t work efficiently. And there are a few GMO crops specifically designed for ethanol. reducing land use. The rest are just designed for feed applications. You know what else doesn’t work efficiently, corn ethanol. Roughly 40% of corn grown in the USA is being used to make it. I would love to hear you elaborate more on how corn ethanol is a good idea. It is more environmentally friendly to use gasoline. Nevertheless, waste cellulosic biofuel has potential to work efficiently and will most likely be able to be made cost effective once it is developed more on a large scale, as it uses waste as feedstock instead of wasting land and resource to grow a feedstock. Growing a crop for specific use as biofuel does not reduce land use, it increases land use, because there is waste cellulose available for feedstock that does not require any additional land. Where is this waste going to come from? I dont think that corn ethanol is a great idea either. The waste material is plentiful. An estimated 323 million tons of cellulose-containing raw materials which could be used to create ethanol are thrown away each year in US alone. This includes 36.8 million dry tons of urban wood wastes, 90.5 million dry tons of primary mill residues, 45 million dry tons of forest residues, and 150.7 million dry tons of corn stover and wheat straw. The GMO seed and pesticide manufacturers are responsible for the current US biofuel and corn ethanol policies, so I don’t think it is wise to be overly enthusiastic on ones support for current use of GMO technology. Perhaps ironically, there are GMOs being developed specifically for the use in cellulosic ethanol production. yes, I am strongly in favor of GMOs for use in creation of cellulosic ethanol. Nevertheless, I just don’t think current Roundup Ready style GMOs are that great of an idea. I think each GMO should be critiqued individually instead of lumping them all together and saying they are all good, or all bad. Looks like I’ll have to get back to you with my sources. In the meantime, what does spraying roundup have to do with evening out drying? Also, most of Europe prohibits GMOs. I know, for a fact, that many US food products cannot be shipped to Europe if they contain GMOs. So, this clearly doesn’t square with your claim that Europe uses this technique more than the US. Plus, Europe is MUCH more stringent on food labeling than the US. For example, if a food contains .1 gems of trams-fat, it will say so in Europe. In the US, a food can contain .49 gems of trans-fats and the label can still claim 0 gems. Basic point, follow the money if you really want to know the truth. Kills the remaining leaves and roots allowing the plant to dry faster, evening out the moisture content. Also, most of Europe prohibits GMOs. Well this is one reason the EU uses roundup more often, you can’t use Roundup to dry down Roundup ready crops. Banning GMOs is also the reason that on average the EU uses 1,5x more pesticides than the USA and over 3 x more than Canada. I know, for a fact, that many US food products cannot be shipped to Europe if they contain GMOs. So, many EU products cant be shipped to North America as well. Your statement on the EU increased use of roundup and pesticide use due to NOT using GMOs is, by inference, directly contradicted by the following study: http://www.enveurope.com/content/24/1/24. Explain yourself. If you want to compare pesticide use between countries you need to go to FAOSTAT, it is the UNs Ag site and they have stats for everything, average yield, pesticides, labour used, and all kinds of other Ag stuff. You can compare country to country, region to region, It is the bomb. Thank you for the great reference. My concerns over increased application of herbicides still stands. It is no different than the anti-biotic wars. We just end up creating more resistant varieties of weeds. Organic farming does none of that. However, it probably cannot support the current world population – that leads to the real elephant in the room. What’s driving all this genetic manipulation is population pressure. We are running out of options on how to feed an exponentially increasing world population – a game we cannot win. A much simpler solution is a rational approach to managing our own population – a subject no one will talk about, but, is really the only answer that avoids massive suffering on a global scale. We just end up creating more resistant varieties of weeds. All farming methods create resistant weeds, there are weeds that are resistant to hand weeding (biomimics) weeds that are resistant to fire, weeds that are resistant to tillage. This is evolution, selection of the fittests there is nothing that we can do to battle this besides using all the tools that modern Ag has, including GMOs. Organic farming does none of that. Hmmm, hardly. Do you think that evolution stops, because someone pays a certifying body. All farming methods lead to resistant weeds and pests. Ag land has been dropping since 96, and we produce even more food. What’s driving all this genetic manipulation is population pressure. Nope, giving farmers more choice has nothing to do with population. World population has not increased exponentially since 1988, and we hit peak child a few years ago. Look at the Data, we will peak at 9 billion then trend down. I’m looking at the data and I see nothing of a consensus that population stops at 9B: https://www.google.com/search?q=world+population+growth&tbm=isch&imgil=-IpldnWir3lGJM%253A%253BK84LmJ9lr58RrM%253Bhttp%25253A%25252F%25252Fwww.zmescience.com%25252Fscience%25252Funsustainable-human-population-growth-0534%25252F&source=iu&pf=m&fir=-IpldnWir3lGJM%253A%252CK84LmJ9lr58RrM%252C_&usg=__vwfTbGAz4tYVniaQL1jmssTh6O4%3D&biw=1394&bih=742&ved=0CDUQyjc&ei=f5IPVdvHHNDWoASnuYGwCg#imgdii=_&imgrc=iLBnEugqzDPKuM%253A%3BG_LEIPJ61jT6nM%3Bhttp%253A%252F%252Fwww.census.gov%252Fpopulation%252Finternational%252Fdata%252Fidb%252Fimages%252Fworldpop.png%3Bhttp%253A%252F%252Fwww.census.gov%252Fpopulation%252Finternational%252Fdata%252Fidb%252Fworldpopgraph.php%3B978%3B753. Also, if your argument that we are always causing genetic change is a reason to not stop or change what we are doing, why is there such a consensus around the use of anti-biotics? Not just a consensus, but, a general alarm that we have triggered something we may not be able to control? Yes, we have, over the last many thousands of years, selectively bred crops to our liking. However, this is a hugely different approach than knifing into the genetic code, and, in some cases, actually mixing animal genes with plant genes. Do you think we have any idea at all what happens when these artificial genes genetically mix and then get expressed in various ways over the course of many generations? I’m not aware of ANY models that can predict those outcomes. So, using valid scientific approaches, when an outcome is unknown, the standard methodology is to NOT promote and assume that only the best outcome is possible. Yet, that is EXACTLY what the Monsanto type corporations AND the FDA are doing when they agree to allow the use of GMOs. This is from the UN, there predictions are normally on the high side, we may not even hit 9 billion if the fertility rate keeps dropping like a rock. Not just a consensus, but, a general alarm that we have triggered something we may not be able to control? Nothing to do with GMo crops or genetic engineering. Yes, we have, over the last many thousands of years, selectively bred crops to our liking. Nope we have also been using random mutations to select for different varieties and traits, orange carrots, rust resistant wheat, dozens of apples. There is no such thing in Nature, plants and animals share most genes anyway. Plant and animal classifications are a human construct, that nature doesn’t care about. Oh and there are no so called Animal genes in GMOs, anyway. there is no such thing as an artificial gene, genes are just genes. So, using valid scientific approaches, when an outcome is unknown, the standard methodology is to NOT promote and assume that only the best outcome is possible. There is no way to know what random mutation could happen in any plant, so should we stop all plant breeding? I you are scared of unknowns, you better not leave the house, there are 1000s of unknown waiting for you. Make up your mind. Are hive collapses caused by GMO’s or climate change? Climate change is more believable than GMO’s, unless the modifications somehow made pollen poisonous, which no one in their right mind would want. More likely, though, is indiscriminate pesticide use or some other form of industrial pollution. There are also theories that stress has something to do with it, though that in itself brings up a whole host of possible factors. People! you totally missed my point. It is NOT the GMOs, per se, that are harmful. It is the fact that GMOs are crops engineered to withstand higher levels of HERBICIDES that are causing the problem. The herbicides, the most common of which use neoctinides (sorry for the wrong spelling! ), are interfering with bee’s immune system. They also are harmful to humans. This direction is also the plant equivalent of anti-biotics. A pointless race that is actually forcing the evolution of ever more herbicide resistant weeds. And, GMOs that are plants specifically engineered to produce no seeds are a terribly immoral approach to capitalism that is driving poor farmers around the world out of business! It is the fact that GMOs are crops engineered to withstand higher levels of HERBICIDES that are causing the problem. Well this is technically true for some GMOs, because you can spray 0 roundup on a non roundup ready crop. But in the real world GMOs just switch around the herbicides and timing, allowing farmers to use LESS herbicides. Why would a farmer pay extra for seed, then have to pay more for herbicides, makes no sense. Also herbicide tolerance is also a non GMO trait, clearfield crops for example. The herbicides, the most common of which use neonicotinoids (sorry for the wrong spelling! ), are interfering with bee’s immune system. Neonics have nothing to do with GMOs or herbicides, they are a class of insecticide, that is used as a seed treatment or for foliar application. A pointless race that is actually forcing the evolution of ever more herbicide resistant weeds. Well not true, the development of herbicide resistant weeds has slowing since the advent of GMO crops, the more tools farmers have the less resistance there will be. terribly immoral approach to capitalism that is driving poor farmers around the world out of business! Neonicotinoids are not herbicides, and have been used extensively in areas like Australia where few or no bee problems have occurred. Resistance to antibiotics, herbicides and pesticides is also part and parcel of evolution. Even dandelions in areas that are frequently mowed become predominantly shorter stemmed because they have a better chance to go to seed by passing under a mower blade. Why blame only certain chemicals when any method of weed control or pest control will eventually select for resistance to that method? Farmers are not unaware of the problem. Most of them realize they need to use methods which delays the resistance problem as long as possible. As for the no seeds, no GMO crops have any sort of terminator gene. Seedless crop are currently limited to non GMO crops like watermelons, which use the ploidy numbers of the parent plants to produce sterile offspring. If poor farmers are being driven out of business by GMO crops, why is the fastest growing sector of Bt seed sales in areas of the world where the majority of farmers are poor? Perhaps they see that the farmers around them that were the first to adopt the GMO seeds also reaped the most profits by not having to spend an incredible amount of cash on repeated doses of insecticides. And, GMOs that are plants specifically engineered to produce no seeds are a terribly immoral approach to capitalism that is driving poor farmers around the world out of business! There are no plants like this. Never have been. For someone with a lot to say, you don’t really have much of a grasp of the facts. Those are chemically treated. And widely loved. Seedless watermelons are not GMO. Except in Maui, where a poorly written law has made them illegal to grow. Still not GMO. Herbicide tolerance is but one trait that seed developers can induce via genetic engineering. Herbicide tolerance has also been induced using radiation breeding/chemical mutagenesis and selective breeding (assuming you had ample time and space to make hundreds of thousands of crosses). It is not unique to genetic engineering. Likewise resistance in pest is also not an issue unique to genetic engineered crops. Any kind of selecting pressure on pest populations will cause resistance to that pressure to arise. Thats just evolution. Survival of the fittest? You know all that jazz. Farmers were dealing with resistance in pests long before the advent of genetic engineering. Your entire post shows you have been getting your information from fear-mongering activist websites, and this has lead to a poor understanding and unreasonable fear of GMO’s on your part. GMO’s have many traits, the RR trait is one of many. The RR trait allows a safer and better-for-the-environment to be used. Any non-GMO crop can tolerate herbicide. This has absolutely nothing to do with GMO or herbicides. The opposite is true. There are fewer overall resistant weeds because of GMO production, however, there are more types of resistance. The misinformers want you to think that more categories means more in overall number. Absolutely false, and proof positive that your sources are either horribly misinformed, or else they care nothing for the truth. It is fair to be critical. It is not fair to use misinformation to criticize. It is quite obvious that we get our information from different sources. I use one criterion to evaluate data: if the source will make money from the information, I treat it with suspicion. This means that any information which comes from Monsanto is highly suspect. From what i have read, it has been the intention to introduce many traits into GMOs, but the majority of those attempts have been unsuccessful. As a result upwards of 90% of GMOs are just RR. The skeptical among us may even question whether RR seeds can be considered successful. is, in my opinion, itself horribly misinformed. I am prepared to grant that there may be scenarios where GM seeds produce higher yields, but the marketing behind them is leading to shifts in agricultural practices that are indeed driving poor farmers out of business. Monsanto, and others of that ilk, are not in the business of feeding the world, as they would have you believe; they are out to make money by whatever means possible. Good to hear from you again, Elizabeth. I like your posts, and I appreciate your criticism. I think that you fair and honest. I think you are wrong–but still, fair and honest. I base my information on my own verifiable experience. I’m wrong sometimes, and when I am I want to change that. I’m convinced I’m right on what I posted. 1) The choice is not Organic or GMO, the choice is Conventional or GMO, and glyphosate is a better, safer herbicide. If the recent news about it being carcinogenic is correct, we need accurate information on that. The biggest reason I’m a fan of the RR trait is that my fields are cleaner now than they have ever been. I do think there is a downside, and that is if farmers rely too much on glyphosate and do not rotate the chemistry. 2)Neonicotinoid. Herbicides are an argument on their own. Insecticides are an argument on their own. Neonicotinoid’s have nothing to do with GMO’s. The argument for or against them stands independent of GMO’s and has nothing to do with GMO. 3)I have fewer resistance problems now than I had 30 years ago. 3% of my acres have a resistant weed, one is mustard to metribuzin, the other is lambs quarter to glyphosate. Pests are spreading across the world. They spread slower when it was ships and horses, they can now–and are now being shipped in cargo containers to every country. The reality is that this won’t stop. The reality is that Organic would be even worse at slowing the spread of these pests. Our farm is using far less harmful chemicals per acre than we used 40 years ago, and even 10 years ago. We are specifically targeting a narrow range of insects, leaving beneficial insects alive. Plants that do not make seeds are nothing to do with GMO, they are hybrids. There are sterile crops–non of them are because they are GMO. Furthermore, “seed farming” and “consumption farming” are different. A crop raised to specifically be a seed will be a better seed. GMO technology can be good or bad. Each trait stands on its’ own, and should be praised or criticised for the specific good or harm it does. This applies to each variety of crop, and each practice–conventional, organic, or GMO. GMO is a tool. I had record yields this year using all the tools available, including record yields on a conventional crop. My fields are in better shape by every measurement than they’ve been in for 50+ years. I’m optimistic for the future. When there is a better way, let’s change to it. No. It is not GMOs per se causing damage to bee’s immune systems. It is the resulting increased use of herbicides and pesticides, many containing neonicotinides (bad spelling, sorry!). Whether or not the increased use of specific products is correlated with GMO crops is up for argument and specific proof. I’m a farmer who farms 70% non-GMO. I’m concerned that you’re getting information from biased sources that will tell you anything to make you anti-GMO. I welcome fair criticism, but what you are posting isn’t accurate, nor is it being fair as to how we are farming. Be aware that GMO production allows us to use far fewer insecticides. In fact, the majority of my Bt trait GMO uses zero insecticides. Pesticides is a term that includes herbicides, insecticides, miticides, fungicides and a few other less common agricultural treatments. I think you are meaning insecticides when you are using “pesticides” above. In our operation, we compost, and we raise some crops organically–meaning that compost is the only input. I see GMO’s as a huge benefit for the environment. I’ll discuss any aspect of modern agriculture in a respectful and transparent manner. All corn is genetically engineered teosinte. Label all gasohol – production, transport, sale – as Franken-fuel. There must be glossy circulars distributed free to the public at every labelled site. What are the unknown hazards of fuel ethanol exhausts? Double-burn them to be sure! This is something they really need to drop, unless they want to start looking like the far right in this country with regards to climate change. You can’t very well call Republicans the anti-science party if Democrats are also embracing emotive reasoning instead of fact-based policy. This is an issue, much like space exploration (“we shouldn’t spend money on space until we solve all the problems on earth” – [big eye-roll]), where I often find myself parting ways with others on the left. Is it too much to ask for a political ideology that tries to be consistent with regards to its approach to science? This is why I don’t pay any more attention to MSNBC than I do Fox News. Do you have some evidence that anti-GMO views are associated with political orientation? Analysis of county voting patterns in recent elections (WA, OR, CA) where there was an initiative to label GM food shows very strong correlations (r2>0.65) between voting Democrat and pro-labeling. Prof Kahan has analysis that suggests otherwise but I have seen his results reconciled with the result above. ??? I don’t know what that means. How do you reconcile Kahan’s data that show no significant polarization on GMOs by political orientation? Plus, acceptance of the “consensus” view w/r/t GMO safety is not necessarily mutually exclusive with support for labeling. Joshua, I don’t think it necessarily has become polarized in the electorate, but it seems as though some of the policy shapers and prominent voices on the left side of the spectrum are trying to make this a wedge issue. I’m only pointing this out because I think this would be a losing position to stake, much as the right has found opposition to gay marriage and other social issues to be. They’d be suffering more on the issue of global warming, but because it is scientifically complex and occurring on a scale of decades, they haven’t yet suffered from backlash as voters begin to realize the impact that it will have on their lives and even more so on the lives of their children and grandchildren. My point is, for the left to remain a power for the betterment of society, we have to be vigilant in making sure the positions we stake are better grounded in reality than the positions of the right. I agree with all of that. It’s a stupid issue to try to exploit politically. There’s an interesting parallel with vaccinations – which some on the left are also trying to leverage for political expediency, therefore creating widespread polarization where it doesn’t actually exists now. But with vaccinations they’re trying to leverage a “consensus” science view, in contrast to the situation with GMOs. Interestingly with vaccines if you look at the county by county pattern then it is the most polarized counties regardless of political orientation that have the lowest vaccination rates. So the loonies at both ends of the political spectrum are the ones that do not vaccinate. I’m not big on the “loonies” terminology (one of my criticisms of Keith, btw). Fair enough. How about “extremists”? That’s my question. Analysis of county-by-county voting in three states shows a clear correlation between the political orientation of the county and the desire to label GM food. Prof Kahan’s survey is often quoted as proof against political polarization because his survey of showed there was none. I haven’t been able to find anyone, Prof Kahan included, that can explain that discrepancy to me. Or rather, I have my theory – and I think Prof Kahan sort of addresses it – but curious to know what other people come up with. 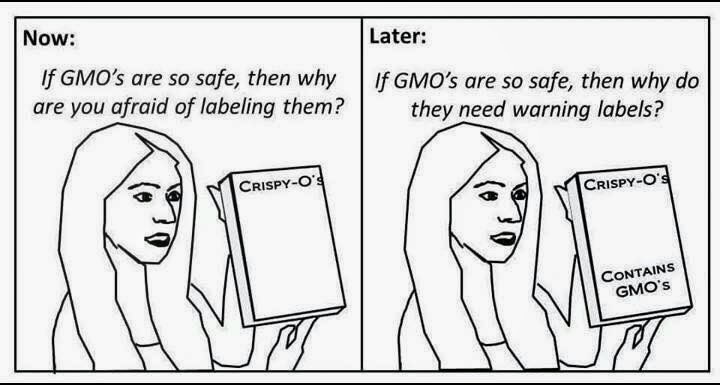 I agree that it is possible to desire labeling without thinking GM food is unsafe. But people who think GM food is unsafe, or are even slightly wary of it, are very likely to vote for labeling so it is a good indicator. I don’t know exactly what data analyses you’re referring to.. but it doesn’t seem you’re comparing apples to apples….in this case, you’re talking about people who came to the polls to vote in particular elections, in particular parts of the country, where an issue has received an unusual amount of attention, and leveraged by partisan entities with particular political orientations, and then were asked questions about their views of a particular issue – which may well have been one of the factors that brought them to the polls to begin with? And then you want to compare that to nationally-representative sampling of people who aren’t being questioned in anywhere near similar circumstances? This seems to me like an issue of mis-matched sampling representation (IOW, unrepresentative sampling), if you’re trying to generalize from a somewhat unique sample to a more general population. I would say that the data you’re referring to might speak to the potential of polarization – but that potential could, theoretically at least, run in the other direction if Republican politicians were seeking to exploit the issue of GMOs for political expediency as they have done with vaccinations, Ebola, the CDC, etc. The analysis I’m talking about is from public data available on the relevant government websites, anyone can do it, fairly simple analysis (plot % Yes on labeling v % yes on Obama 2012). And I think you have a point about representative sampling but then the question is: which is the representative sample? Prof Kahan polled 1,800 (?? I think…that’s from memory because I can’t find where I read that right now) nationwide and concluded that (1) most people don’t care about the GM issue, (2) they are not polarized and (3) they are in danger of becoming polarized. That’s my summary of this: http://www.culturalcognition.net/blog/2012/10/15/timely-resistance-to-pollution-of-the-science-communication.html. And I think the survey was done in 2012. However, the recent initiatives (2012-2014) in the three western states are a poll of 15+ million voters who were *made to care* because of an initiative that was going to affect them directly. When that happened, strong evidence of political polarization is evident. Seems like that is “some evidence” that anti-GM views are associated with political orientation. Maybe it’s better to conclude “most people don’t care about the GM issue but if they are made to, they become polarized”. I think it’s pretty simple to reconcile the two. In Kahan’s polling, he is looking at people in a low information, non-energized environment. In that case, most people don’t care across the political spectrum until you get to the left and right poles, in fact right wingers (think Alex Jones and InfoWars) care even more about GMOs than their counterparts on the left. When you introduce a political campaign the organizers reach out to enviro and consumer groups that skew left who can persuade mainstream liberals. There are no natural allies on the right to reach conservative voters. When the GMO debate becomes energized, the denialims skews left. But prior to that polarization, it’s non-partisan. They need to focus on the REAL issue! Do we want corporations to own the genetic rights to our food production or not? Today, thousands of farmers around the world are going bankrupt because their GMO crops fail to produce seeds for the next season and they cannot afford to buy the Monsanto GMO seeds. It is a corrupt and immoral practice! We have had plant patent protection in the U.S. since 1930. And no, no corporation owns the genetic rights to our food production, you can only patent novel traits. Even then a patent only lasts for 20 years. I know you’re just repeating activist memes, but for crying out loud, think for a minute! The marketable portion of a GMO corn plant is the corn kernels which are, yep, the seeds. The marketable portion of a GMO soybean plant is the soybean which is also the seed. Do you think any farmer would grow corn that didn’t produce corn kernals or grow soybeans that had empty pods? That whole “terminator” thing is another activist meme, GURT technology has never been commercialized. That is exactly how I would describe the behavior of anti-GMO activists who lie all the time and get gullible people to believe their lies! It sounds like you know what you are talking about. But, answer this one question: is it true or false that Monsanto specifically created seeds who’s plants would fail to produce viable seeds of their own? It is false. The technology was created by a different company. That company, along with terminator seed technology, was later bought by Monsanto. Monsanto has never commercialized the trait, and said it had no plans to. That being said, there are plenty of non-GMOs that don’t produce seed that can be effectively replanted. Seedless watermelons. Bananas. Apples. The idea was taken from a patent owned by the USDA and DeltaPine. It is not even clear that the technique patented would result in what was claimed. No, Monsanto didn’t create GURT technology. That was Delta Pine and USDA. Monsanto did buy Delta Pine, but they shelved the GURT work. Fail to produce seeds?? Where did you hear that nonsense? GMO crops produce seeds just like any other. In many countries, patent right prohibit a farmer from replanting them, while the patent is active. For example, in Canada and the US Roundup Ready soybeans are off patent. Anyone can save and replant. Regardless, though… replanting ones own seeds is generally a gardeners practice… not a farmers. Farmers plant hybrid seeds when available in a crop (corn for example). The seeds harvested by the farmer are not hybridized and therefore are not replanted… GMO or not. for non hybridized seeds (like soy) farmers still generally by freshly produced varieties because seed companies control pollination of the varieties they sell. That means, farmers can choose specific varieties that perform well on their fields. When harvesting their own seeds, they have little to no control over that. Plus, they then have to pay someone to clean harvest debris out of their seed. Because commercial seed tends to perform better, farmers generally opt to buy it year after year… GMO or not. However.. even if what you were saying was true (it is not), all a farmer would need to do is choose to buy non patented seeds. Then they are free to replant what ever they wish. So why is it bad to offer these choices to growers? Very well put. People perceive that saving seed is free, therfore farmers must be coerced or conned into purchasing seed each year. But as you point out, saving seed is not without cost — cleaning, storage, foregoing the income from the saved seed, and the opportunity cost of foregoing new seed genetics. You also have to take into account cost saving certain genetics can provide in avoided husbandry costs. Additionally, you take risks of seed spoiling or bug, rodent infestation, quality deterioration that can reduce germination and performance. Another thing as you point out, genetic drift and yield drag are possible. By purchasing seed, the farmer transfers these costs and risks to the seed supplier. People look at the seed cost, say for bt cotton but dont see the cost savings in avoided pesticide expense. I am not arguing that there is not social value in farmers having access to public domain seeds, nor am I suggesting seed saving is an impossible task-farmer can become very skilled at it. I am just arguing that purchasing seed can easily be explained as a rational economic choice, it doesn’t require coercion to explain. Most of the patented seeds that farmers in this country and around the world chose to plant are in cash crops, those grown to market in cash markets. Very few varieties that are grown by subsistence farmers for household use or grown for direct marketin in local markets are improved through biotech and those few that do exist or are being developed in the developing world are publicly held licensure with nonrestrictive reuse, and in fact seed saving and sharing is explicity allowed and encouraged (bt brinjal, golden rice, banannas in Africa). In the US, is has long been a practice for farmers to annually for hybrid crops and frequently even for open pollinated crops to purchase seed. I grew up in wheat country of western Nebraska in the 70’s, and even though wheat could be saved back for planting next year, and many did, even then most farmers purchased at least a portion of wheat seed each year, to take advantage of newest varieties, and to avoid seed saving costs and risks. I go back to my original point: if there is nothing wrong with GMOs, like there is nothing wrong with fats and carbohydrates, why is the food industry and their corporate masters like Monsanto fighting so hard to prevent the simple truth of labeling them? There is no difference in fats or carbs between GMO and Non GMO crops. GMO is a plant breeding method, that is why it is not labeled. Ronald, fats and carbohydrates have a know health impact. “GMO’s” do not. Why would you try to compare the two? Regardless… no one is fighting to prevent “truth of labeling”. The fight has been over whether or not the govt has the right to mandate that every food producer market (via their label) their product in exactly the same way. Absent of any “public need” the govt has no right to mandate what private companies put on their labels. The fight has been to keep that decision with the companies and not with the govt. Companies are free to label their products how they wish to with respect to ingredients produced using genetic engineering. If they see a marketing advantage in labeling, they should be allowed to do so. If they don’t why should they be forced to?? In Europe people simply don’t trust the US research about Roundup and came with their own research that claims that glyfosates can “likely” cause cancer. Roundup is increasingly banned in EU and especially the TTIP talks do frighten people that the EU is forced to accept GMO products. Currently Greenpeace (what’s new?) is launching an high profile anti Monsanto campaign. Certainly the discussion in EU is far from what it is in the US. I don’t think researchers in Europe concluding differently. Germany regulators finished up a 4 year reassessment of glyphosate. I got schooled here by some well-informed readers – thank you for that. I still have this issue: The EU has, since 1997 (http://www.gmo-compass.org/eng/regulation/labelling/96.labelling_gm_foods_frequently_asked_questions.html) required the labeling of all GMO foods (with the indicated exceptions). They do NOT treat it as a warning. It is simply a label that informs the consumer about the ingredients of the food they are about to eat and allows them to make a decision. What is happening here in the US is an all-out war by Monsanto, many farmers, and other agribusiness to PREVENT any kind of labeling regarding GMO. See H.R. 1599 that is receiving heavy support from Monsanto (http://www.thefencepost.com/news/15663001-113/gmos-on-the-hill-congress-looks-at-multiple-bills). My point is, again, if there is nothing wrong with it, and, if in fact, in many instances GMO foods are MORE nutritious for you than normal, wild, natural crops, then why don’t you want to announce that and be proud of it? Why is the industry insisting on hiding the actual FACT of GMO foods from the consumer? Occam’s razor demands the simple explanation: Greed. It is cheaper, apparently, for them to lobby Congress, keep people ignorant, and ram through these methods than to take the time and expense to educate people, run commercials, etc. Also, I have not heard a convincing argument on why the use of roundup ready crops doesn’t result in a never-ending war of escalation against weeds that continue to evolve against stronger and stronger herbicides. That has happened with antibiotics to the point where the world is in danger of losing effectiveness against these agents. And, as you all know, WHO recently released a report indicating that roundup is, in fact, carcinogenic. To what extent remains to be determined, but, it IS a concern for the farmers who apply large quantities and are thus exposed to large concentrations. Ronald, regarding labeling, the issue is that it’s uninformative, and for most consumers would be confusing. See Jayson Lusk’s results on consumer demand for labeling of food “containing DNA”. (Page 4, here: http://agecon.okstate.edu/faculty/publications/4975.pdf) You can see where this goes, right? If you require a label, people see that as a warning. But they have no clue what it means — hence the demand, by an equal percentage of respondents, for a “warning” about DNA. If you want labeling based on pesticide use or chemical difference in the produce, by all means, make the case. But then do it consistently across all ag products, including all the non-GM varieties that also are treated with ag chemicals along the way. (If you hate synthetic chemicals, your only out is organic. But you’ve already got that option.) But if I buy a bag of sugar made from beets, there’s no chemical test I can do that will distinguish wither it was derived from GM herbicide tolerant beets or traditional beets. It’s just sugar (with neither DNA or protein). So what exactly is this suggested label supposed to be warning me about? Incidentally, with regard to the claim that Monsanto is “hiding something”: they *do* label their products. Their product in this case being the seeds that they sell to their clients, the farmers. Clearly labeled. I’ve always found “Frankenfood” to be a strange choice of memes for the anti-GM crowd, particularly as a scare tactic. If you know the real story by Mary Shelley this meme makes reference to, Frankenstein was a largely misunderstood guy who actually had lots of good to offer the world. But he was demonized by those who did not understand him. In their rage and ignorance, the crazed villagers resorted to violence and plundering to destroy him. Needless to say, in their own metaphor, anti-GM activists are crazed, ignorant, torch-and-pitchfork wielding lunatics bent on destroying what they can’t be bothered to understand. Then I think of destruction of field plots for Golden rice in Philippines, GM wheat in Rothamstead, and many other places. Life imitates art? mandatory labels on genetically modified foods. And most say they’d use those labels to avoid the food. broad doubt on the very basic issue of food safety. Nearly everyone, moreover — 93 percent — says the federal government should require labels on food saying whether it’s been genetically modified, or “bio-engineered” (this poll used both phrases). Such near-unanimity in public opinion is rare. meeting consumer demand for labeling, it would be steering business away from its genetically modified products.